If you’re following me on Instagram you might have seen that I’m currently stranded in London waiting for my passport to be renewed. To be honest, I’ve found the last couple of weeks very stressful. As a British national living in France, I’ve been glued to the Brexit news, feeling incredibly worried and unstable about my future. I’m sure I’ll be fine and France won’t be throwing me out of the country any time soon, but it’s been very unsettling not knowing what’s going on. Never in my life did I think I would be in a situation like this. Growing up I always thought I was so incredibly lucky to have (what I thought were) two of the best passports in the world - I also have American nationality (although my passport is currently expired), as my mum is from California. But these last few years I’ve felt less like this, obviously due to the political situations in both countries… Anyway now that I’m in a waiting game in London until my passport arrives in the post (hopefully by the end of the week), I’m trying to make the most of my stay by seeing friends and setting up as many meetings as possible. Fortunately spring has finally sprung in my old city and as I write this on a Monday morning, there are bright blue skies and the sun is shining through the window. Whilst wandering around Southbank yesterday on my way to Tate Modern to see the Dorothea Tanning exhibition (highly recommended) with my dad, I felt all the tingly feelings that spring often induces. There was a sharp chill in the air, but as we sauntered next to the river Thames and over the Millenium Bridge after our gallery visit, towards St Paul’s, I noted the smiles on peoples faces and the beautiful blossoms blooming on the trees. So I thought it high time I published this post, which has admittedly been sitting in draft-form for the past month. I actually shot these photos in mid February, when we had those unprecedented warm days - the warmest days on record to arrive in February, ever. A week later we were back to winter, so I thought it premature to publish an article on slip skirts and sandals! But with it becoming officially spring a few days ago, it’s time. I snapped up a few slip skirts - including this neon green style from ASOS, which seems to have gone a little viral. 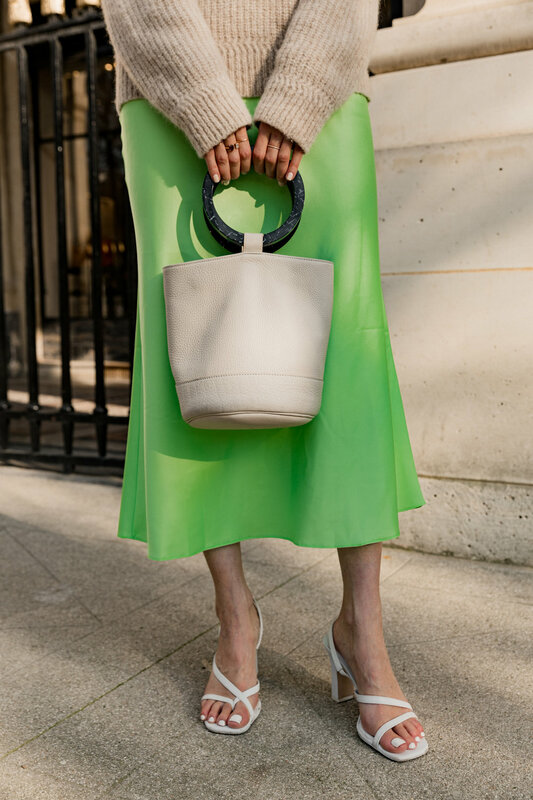 I wrote about it for Who What Wear UK, when mentioning the spring trends Parisians will be wearing, they then dedicated a whole article to the skirt and it was recently picked up by Grazia UK. It’s still available in a few sizes, but I’ve also curated my favourite slips skirts found on the web! Wear with a chunky plain knit over a t shirt, or pair with a neutral blazer - like this beige or navy style - and then layer over with necklaces. (I love Alighieri). It will also look great with a denim jacket or beige trench. Then finish with barely there sandals (of course when the weather gets warmer), dad trainers or long white boots.